نیو یارک شہر، نیو یارک، U.S. In 1966 Alan Greenspan wrote "Deficit spending is simply a scheme for the confiscation of wealth. Gold stands in the way of this insidious process. It stands as a protector of property rights. "سونے دی غیر موجودگی وچ دولت نوں افراط زر دے نقصانات توں بچانے دا کوئی وی طریقہ ممکن نئی‏‏ں۔ "
In the absence of the gold standard, there is no way to protect savings [i.e. wealth] from confiscation through inflation. There is no safe store of value. "Former Federal Reserve Chairman Alan Greenspan issued a bold warning Friday that the bond market is on the cusp of a collapse that also will threaten stock prices." as early as 1998, soon to be chairperson of the Commodity Futures Trading Commission (CFTC), Brooksley Born, approached Alan Greenspan, Bob Rubin, and Larry Summers (the three heads of economic policy) about derivatives. "the super-low interest rates Greenspan brought in the early 2000s and his long-standing disdain for regulation are now held up as leading causes of the mortgage crisis. The maestro admitted in an October congressional hearing that he had "made a mistake in presuming" that financial firms could regulate themselves." 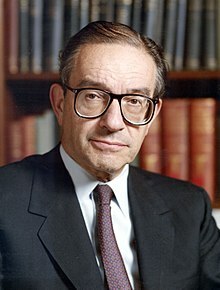 honest money and freedom are inseparable, as Mr. Greenspan argued, and paper money leads to tyranny"
"Nonetheless, we recognize that inflation is fundamentally a monetary phenomenon, and ultimately determined by the growth of the stock of money, not by nominal or real interest rates."